The aim of this study is to assess the value of the angiogenic factors for diagnosing preeclampsia and predicting the severity of manifestation. A secondary aim is assessing the combination of the uterine artery Doppler with the angiogenic factors for improving the diagnostic power. This is a prospective single center study in a tertiary referral hospital. This study includes 728 individual patients. Inclusion criteria were singleton pregnancies, a referral to the hospital with suspicion of preeclampsia and any one or combination of the following symptoms: headache, upper abdominal pain, edema, and hypertension. 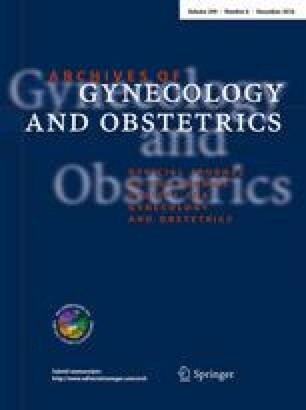 Patients with complications that would affect the course of the pregnancy, such as placenta praevia, premature preterm rupture of membranes, breech presentation, and fetal chromosomal or structural anomalies, were excluded from the study. Blood samples collection and uterine artery Doppler ultrasound were performed at time of recruitment. The differences in sFlt-1, PlGF, and their quotient among normal collective and patients with preeclampsia were analyzed. Doppler ultrasound was performed by one of four highly qualified sonographers. Wilcoxon–Mann–Whitney U test, Spearman’s rank correlation, receiver operating characteristic curves, Chi-square test, and logistic regression were used in the analysis. A total of 1003 individual samples for the angiogenic factors were included in the analysis. 584 out of the recruited 728 patients had follow-up data with delivery information at the study hospital. Patients with preeclampsia show a significant increase in sFlt-1, which directly correlate with the increased severity of manifestation (Spearman’s ρ 0.49). The sFlt-1 cut-off value of 5424 pg/ml confirms preeclampsia with 83.7 % sensitivity, 68.1 % specificity, and 24 % misclassification rate. Preeclampsia patients also show a significant decrease in PlGF, which negatively correlates with the increased severity of manifestation (Spearman’s ρ −0.39). A PlGF cut-off value of 118 pg/ml confirms preeclampsia with 47.6 % sensitivity, 71.4 % specificity, and 27 % misclassification rate. Logistic regression shows that a combination of the quotient from sFlt-1/PlGF with notching and uterine artery PI provides a valid model for diagnosing preeclampsia with a diagnostic power of 74.4 %. The study confirms the use of the sFlt-1 and PlGF for diagnosing preeclampsia. It also shows their significance in differentiating between different categories of preeclampsia according to severity. This study shows that the use of angiogenic factors in combination with ultrasound findings provides valid models for confirming preeclampsia. This work was supported by the Dr. Senckenbergische Stiftung, Frankfurt am Main. Bahlmann and Al Naimi declare that we have no conflict of interest.